At the northern most point of the great state of Wisconsin lie the Apostle Islands; nuggets of pristine wilderness scattered throughout a tiny section of the great inland sea we call Lake Superior. Here, dotted amongst a horizon-less sea of clear, cold, aquamarine waters are islands with towering clay banks and forests as wild as legend; save a few lighthouses that once guided the captains of yesteryear safely to port. Wilderness. Solitude. Fish. Just another day at the office. My name is Captain Tommy Hicks, Jr. I was born and raised in Ashland, WI and the great Gitche Gumee (particularly the Apostle Islands and Chequamegon Bay areas) is my home water. My father of the same nomenclature, a seasoned navigator and fisherman in his own right, started teaching me when I was quite young the skills necessary to navigate this formidable inland sea. Although I’m still fairly young, I have, nonetheless, spent a lifetime fishing Lake Superior. I am fortunate to have been able to turn my passion into my profession; starting Beyond the Catch Guide Service several years ago (beyondthecatch.com). It’s a great way to spend life; guiding people to lakers, brown trout, Coho salmon and the occasional steelhead in some of the most picturesque settings in all of Wisconsin. During May way up here in the Apostles, the ice is long gone, but the waters of Superior remain cold, not only now, but for much of the year as well. On average, surface water temps at their peak in summer only climb into the 50s. Granted, there have been exceptions throughout the years, such as 2012 where water temps rose into the 70s during that particularly hot summer (one for the record books), but those are usually anomalies. On colder-than-usual years, water temperatures may struggle to get into the 40s. 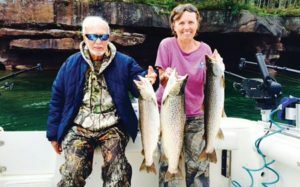 So with cold water temps for a good portion of the year, and a fishery chock full of species that favor those temps, fishing for browns, Cohos and the like on Lake Superior in the Apostles can be done near shore for a good portion of the calendar. In May, the fish travel to near shore waters following smelt; a preferred forage. Because of the target species’ affinity for pelagic baitfish, trolling is a preferred presentation method. Out of my 28 ft. Boulton (complete with heated wheelhouse and air-ride seats for those of you looking for a little comfort out on the greatest of Great Lakes) I run two mainlines, one port and one starboard. On the end of each mainline is a giant homemade planer board that pulls the mainline away from the boat. Through a series of clips my rod lines are attached to the mainline and sent back approximately 100 ft. with Rapala Scatter Raps, Countdowns, Husky Jerks, or your classic laker spoons on the business end. Most of my lines are flat lines, but I will sink a few lures on downriggers or dipsey divers if I want to fish deeper water. It’s good to cover all water and keep your options open. When I have all my lines set (FYI it’s easier to set lines going into the wind) I typically will troll 2.5 to 3.5 mph depending on current and fish activity levels. Superior, being more of a great inland sea rather than a lake, is prone to currents known as a seiche; which is basically current caused by changes in atmospheric pressure. These currents will affect your trolling speed and proper bait presentation. Going into the current you can “slow your roll” because the baits will drive head on into the current and still produce the desired action at slower speeds. The opposite is true of trolling with the current; more speed to achieve optimal lure action. This scenario plays out for most of May and June depending on water temperatures and forage movements. In June, fish can be found deeper as well as near shore, so it’s basically the choice of the fisherman if they want to battle a fish out of deep water, or stroll along the beautiful shorelines of the Apostle Islands. June is a month of opportunity for fishing success across all water columns as long as baitfish and water temps allow. 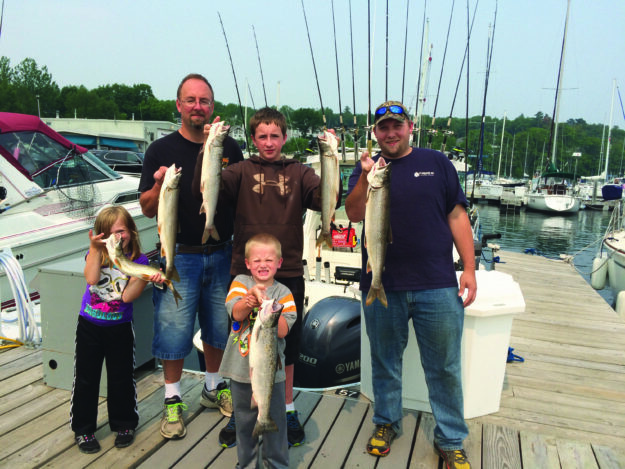 The Lake Superior regions around Ashland, Washburn, and Bayfield are some of the most beautiful regions in the state, and May and June can be prime time for both spectacular scenery and fishing. Catch and release trophy lakers and browns, with plenty of splake and Cohos for the table. The clear, cold waters of this giant oligotrophic freshwater inland sea harbor exceptional table fare as well as trophy caliber fish. Ashland, WI also caters to fisherman with superb bait shops and lodging; the likes of which can be found at the River Rock Inn and Bait Shop (riverrockinn.net) and Angler’s All (anglersallwisconsin.com). If you’re looking for an adventure on BIG water with some of the most spectacular vistas around, the Apostle Islands might be the place you’ve had in mind. Wilderness and adventure way up at the top of the state; a place that feels as though it’s actually the top of the world. Captain Tommy Hicks, Jr. has been a full time guide in the Ashland, WI area for the last 4 years. 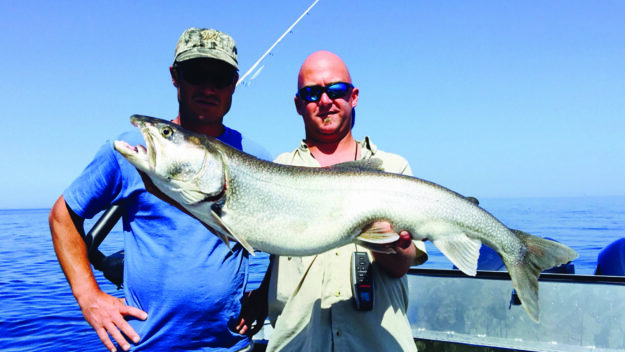 Considered to be one of the finest young captains in the area, he has expanded his career into several television appearances with various programs; most notably several outings with the Larry Smith Outdoors crew. Check out Beyond the Catch at beyondthecatch.com and also like them on Facebook.